The Colorado Symphony is one step closer to getting financial relief from the city. Arts reporter Corey Jones attended a Denver City Council Committee earlier this week where the City agreed the Symphony’s rent at the Boettcher Concert Hall should be $1 for the 2014-2015 season. Colorado is working on growing its creative economy, and the western town of Carbondale is part of these efforts. Marci Krivonen of NPR member station Aspen Public Radio has more on Carbondale’s push to become a creative district. 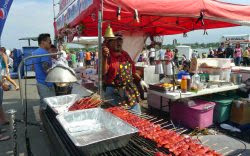 Your taste buds may be the best way to experience the many cultures represented at the Colorado Dragon Boat Festival this weekend. Chloe Veltman joins Filipina chef Leah Eveleigh and the Festival’s executive director, Erin Yoshimura, in the kitchen to talk about the Festival’s new foodie event, the Culinary Dojo. An audit of History Colorado revealed a significant drop in funding levels for preservation projects. But History Colorado chief Ed Nichols says that the funding situation will soon bounce back. At this year’s Dragon Boat Festival, Colorado lion dancers will compete for audience votes to win the first ever “Lion Dance Extravaganza.” In anticipation of the showdown, we asked one of the competing ensembles to record a lion dance routine for CPR’s airwaves. ​CPR's "Colorado Art Report" airs on Fridays at 10.30 a.m. and 7.30 p.m. Tune in live or access online at any time.